We're thrilled to announce a new partnership with a fellow Minneapolis-based company, Sezzle—a payment solution that enables you to "Shop Now and Pay Later" with simple interest-free installment plans. We know that the $300 price tag for the jamstik is not a small purchase, so we're excited to offer a financing solution that makes owning a smart guitar more accessible than ever! Sezzle makes it possible to split up your purchase into 4 easy interest-free payments spaced 2 weeks apart. 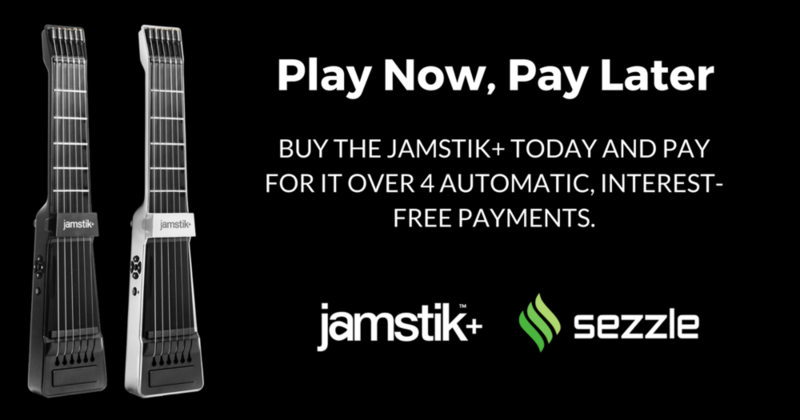 Sezzle is fully integrated with the jamstik+ website, so all you need to do is select Sezzle as your payment option at checkout when you're ready to buy. Unlike other financing plans out there, with Sezzle, there are no long forms or need for detailed personal information—the system simply uses your bank statements to process your application on the spot. Want some more information on how it works? Head to the blog on jamstik.com or check out the FAQ from Sezzle. Are you a merchant interested in integrating Sezzle? Their team was super easy to work with and helped get us integrated in no time! You can use code, "SZL10179" at checkout to get your first month free.